What to do with an old F1 car? ahh... imagine if you got your hands on a million dollar chassis of an F1 car, what do you think you'll do with it? Funniest Video I've seen this year! mannn... I laughed so hard I fell off my chair while watching this! This is a clip from a Japanese TV show where the players are not allowed to laugh at the person who is trying to learn english. If they laugh then they get punished with a beating. ugh... Looks like the boys in red are back. Schumi won the Euro GP yesterday convincingly after beating the Renaults in the second pit-stop. Looks like it's gonna be a good fight between Ferrari and Renault. As usual, team Mclaren was disappointing with Kimi Raikkonen finishing 4th with just 0.5s from Ferrari's Massa and Montoya retired from some car problem. This seem to be the usual problem in Mclaren I reckon. For the past 3 seasons, the team seem to be facing reliability or performance problem in the first half of the season. They will pick-up in the mid and end of the season but by then, it is a little too late to catch up in both the drivers' and constructors' championship. I guess, this time round, there will lose more than that.. both their drivers. Guess what? I didn't even know that the tournament is actually going on at the moment in Japan until I read the headline on star online this morning.... MALAYSIA WINS DRAMATIC MATCH WITH S. KOREA TO REACH SEMI-FINALS. Semi-Finals?! hahaha.. Didn't even know that it has started already! Sigh.. that shows how little coverage the sport is given here in down under... or any online news site actually. Oh well... Hope we can reach the finals. Mission Impossible III is the first of the many movie in the summer blockbuster season. I would say it is a promising start... it's not spetacular but it lived up to its' hype. Tom Cruise returns to the role of IMF Secret Agent Ethan Hunt. In this action-thriller-adventure, Hunt confronts an invisible international weapons dealer - Owen Davian (Academy Award winner Philip Seymour Hoffman). To add to the plot, he has to balance between work and his personal life which, has catatsrophic consequences when those two cross paths. Firstly, the cast is very well assembled... very well balanced and suit their respective role. And with the storyline, the have seriously plenty to do. Altough I wish they would give the characters more depth... but then again, this is MI:III... it's all about Ethan Hunt. It is interesting to note that the film is co-written and directed by J.J. Abrams... yup, that guy from Lost and Alias. 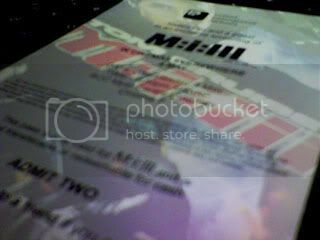 You would notice that MI:III is a bigger budger version of Alias and Lost. Being a huge Alias and Lost fan, I noticed his style of action, character, comedy and drama is migrated to the big screen. I am not saying it's bad... but it seem so familiar and predictable. Nonetheless, it's a good effort by J.J. Abrams. The scenes in MI:III bring you to the Berlin, the Vatican and Shanghai. Yeah... you can just imagine Sydney Bristow doing those things. Talkin' about Sydney Bristow, it is interesting to note that Cruise does his own stunts in MI:III. The action scenes were quite impressive and believable as well. One thing I can't accept is the fact Ethan Hunt can open any lock (under 5 secs) with almost anything he could get his hands on! 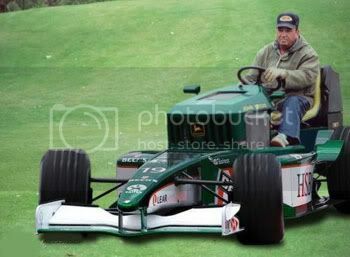 hahaha..
What to do with an old F1 car? Funniest Video I've seen this year! ROFL! why is it only that tanaka and endo guy that finds "ten ten" funny? Thanks for sharing your opinion. Hope it's better than the crap MI2, which made me lose all respect for John Woo. Woohoo! MI:III Preview Tomorrow!